Yes people...I am the one on the road that refuses to go over 55 mph. Please for the LOVE of God hold the dirty looks. I am following all road rules and driving on the right side so you can pass. YOU CAN PASS...it's a passing lane...so just pass, but hold the dirty looks. I am driving a dad-gum land yacht...I get 12.9 miles to the gallon in the city and barely 18 miles to the gallon on the highway. I am NOT going over 55 mph. I am also towing 4 doodlebugs and 2 1/2 adults most of the time. I am saving gas everywhere I can and that starts on the road. So, yes people it's me in a big hunter green Expedition driving 55 mph, and that is you passing me...just wave, be friendly, and pass! Just wave and pass...'cause I am saving gas! So last week I took Doddlebug #1 out for some needed "girl time". She was such a tremendous help while everyone was sick. In fact, she started loading and unloading the dishwasher and bringing everyone glasses of ice water and Popsicle's without being asked. Not to mention, vacuuming and just asking me if I needed her to do anything...so thoughtful. So, I took her for her first mani/pedi. I told her she could pick ANY color she wanted and I would not say a word. So we walked out of the salon with neon blue fingernails and neon green toenails with white and pink flowers. Needless to say she pretty much glowed in the dark! On our way home, Kenna expressed how much fun she had and enjoyed being with just me and not being interrupted while trying to talk, she also expressed that "next" week when she had special time with daddy she would go somewhere he could look at motorcycles...still so thoughtful. Kenna- "Mommy?" "Do you think I am old enough to be sabotaged?" Mommy- "Um, well Kenna tell mommy what do you exactly mean by "sabotaged"?" Now clearly I understood that she must have the WRONG word, after all what six year old know what "sabotaged" means? Kenna- " You know mommy, like after you ask Jesus in your heart and they put you under the water?" Mommy- "Kenna, do you MEAN baptized?" "Like being SUBMERGED in water?" Kenna- "Yes, ma'am, that's what I meant." It started the day he developed a fever...he stared saying "Has anyone seen the thermostat? ", he meant "thermometer". Then it was 200 times a day "Where is the thermostat?, "Did you see where I laid the thermostat?" "I can't find the thermostat." I thought I would go crazy. I did over the course of 10 days twice say, "Look genius, it a dad-gum THERMOMETER!" So yes I cracked...under pressure and smarted off, but only twice, other than those two times, I got up and located his "thermostat" and took his temperature. I still think he is hunky though! So we are in week #4 of having a terrible virus that has run through our household. The 2nd week after school let out #2 and #3 doodlebugs contracted this virus and landed themselves a nice three day stay in the hospital for de-hydration. 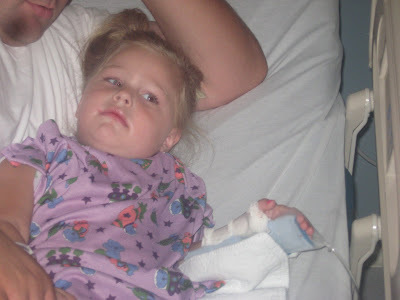 We got them home and the very next day doodlebug #4 came down with fever and continued to follow the path. This virus last 10 days at least so on day #6 of #4 being sick the unimaginable happened...the Chief got sick! I had to share this adroable photo of my son. This is exactly as I found him the other day and when he had finished the paper he moved onto the Flex!